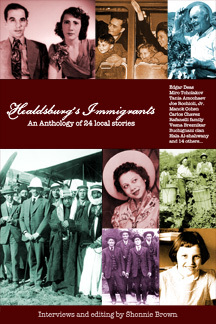 Healdsburg's Immigrants: An Anthology of 24 Local Histories is a book of 24 unique and compelling stories as told by immigrants living in the small towns of Healdsburg and Geyserville, California. The people in the book come from all walks of life and from the Americas, Europe, Asia and the Middle East. They tell first person accounts (or their parents' stories) of some of the 20th century's most impactful events––the 1917 Russian Revolution, World War II, mass migrations to the U.S., political upheaval in Central America, illegal immigration, Soviet and Nazi takeovers and the impact of communism worldwide. Some of the book's participants are very well known, with stories that have never been told in such detail. 368 pages Paperback 6" x 9"
"In Healdsburg, there is a tangible sense that people love where they live. Healdsburg Immigrants, gives new depth to that awareness, with a kaleidoscope of stories of striking diversity. They show an extraordinary peregrination to a tiny town in Northern California. People arrived, some by chance, others with great intention, all unified by having overcome life-altering adversity to meet up here. They are in the bakery line with you. You pass each other at the post office. The dust that covers your shoes on a walk in the country may have held their first hard-earned harvest. Shonnie's accounts become an eloquent braid that weaves us all together, as with every tale, we examine our own meandering path to the place we all call home." "Tempered by bravery, tenacity and hard work, the vivid stories in this page-turner illuminate many immigrant strengths and sacrifices. While each chapter is intensely personal and some challenges specific to the time period and country of origin, universal truths shine through that will resonate with readers. The book brims with profound joys and sorrows, yielding surprisingly few regrets. 'I remember feeling protected and loved, even though I sensed great turmoil and tragedy around me,' recalls one brave survivor. Healdsburg's Immigrants succeeds as a local history book, a poignant collection of memoirs and a true adventure book. I couldn't put it down." "Shonnie Brown's powerfully written narrative of immigrant journeys leading to Healdsburg illustrates the struggles, losses, and triumphs of the human condition; heartwarming, others heart-wrenching. The strength of will, sacrificing one's homeland, overcoming cultural, social and political detours leading to a new homeland, where their lives took root in a welcoming soil––adding to the diversity and strength of community. These immigrants are an integral part of the definition of who we are and where we live. Shonnie has unearthed timeless treasures of exceptional stories adding to a deeper, common understanding of the elegant fabric which is our American immigrant history." ©2005-2015 sonoma LifeStories, Shonnie Brown; all rights reserved.